Karathanassis, Ioannis K. Koukouvinis, Phoevos Kontolatis, Efstathios Lee, Zhilong Wang, Jin Mitroglou, Nicholas and Gavaises, Manolis 2018. High-speed visualization of vortical cavitation using synchrotron radiation. Journal of Fluid Mechanics, Vol. 838, Issue. , p. 148. Iben, Uwe Makhnov, Andrei and Schmidt, Alexander 2018. 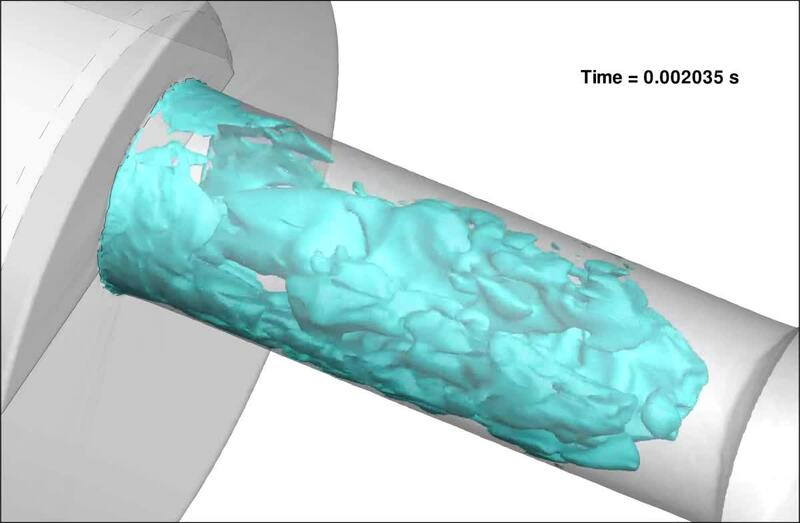 Three-dimensional numerical simulations of turbulent cavitating flow in a rectangular channel. Vol. 1959, Issue. , p. 050013. Iben, Uwe Makhnov, Andrei and Schmidt, Alexander 2018. 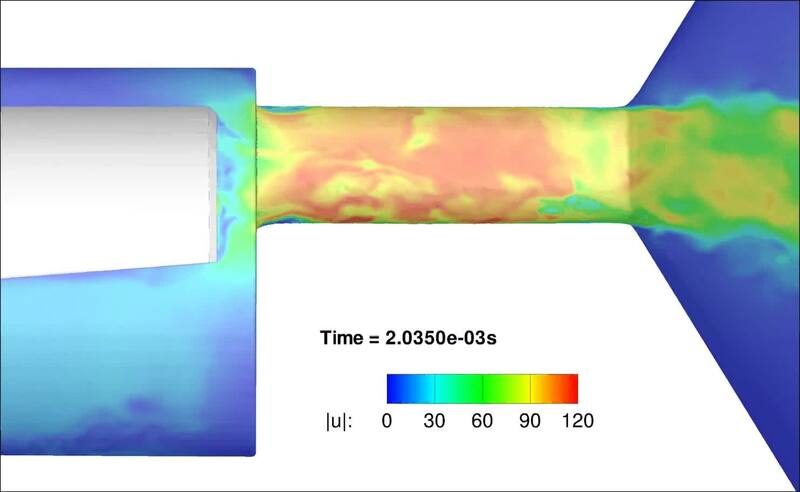 Numerical study of the effects of dissolved gas release in cavitating flow. Vol. 2027, Issue. , p. 030128. Naseri, Homa Koukouvinis, Phoevos Malgarinos, Ilias and Gavaises, Manolis 2018. 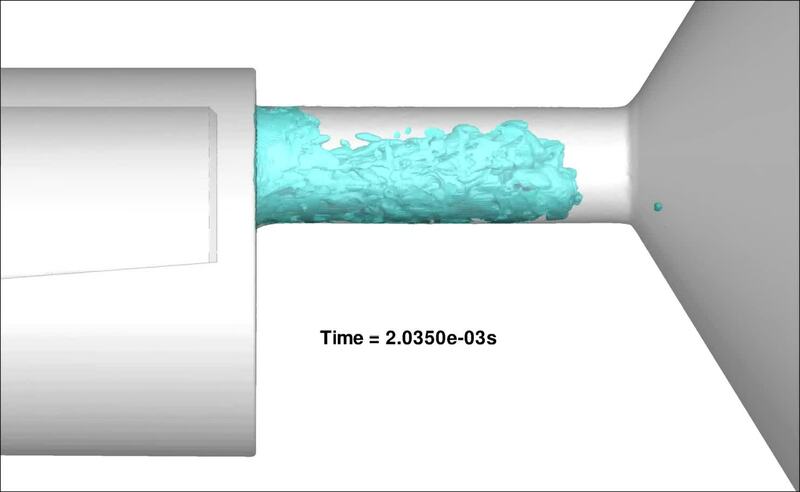 On viscoelastic cavitating flows: A numerical study. Physics of Fluids, Vol. 30, Issue. 3, p. 033102. Lee, Hyung Ju Choi, Hojin Hwang, Ki-Young Park, Dong-Chang and Min, Seongki 2017. 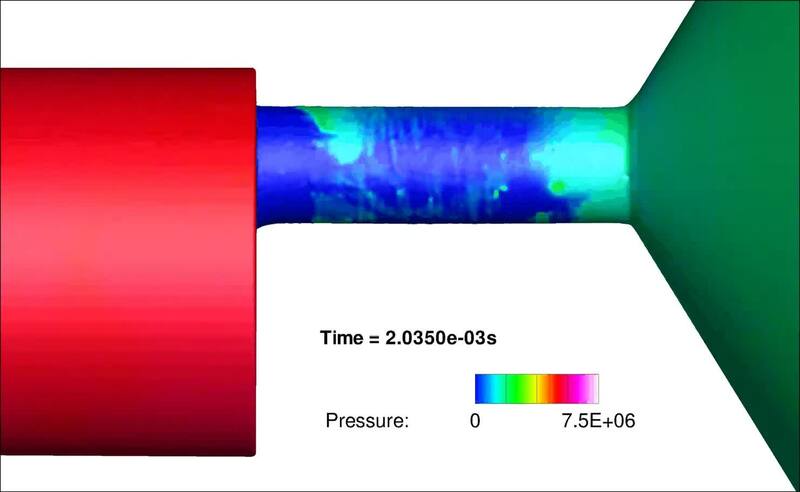 Numerical study of choked cavitation in high temperature hydrocarbon liquid jets. International Journal of Heat and Fluid Flow, Vol. 68, Issue. , p. 114. 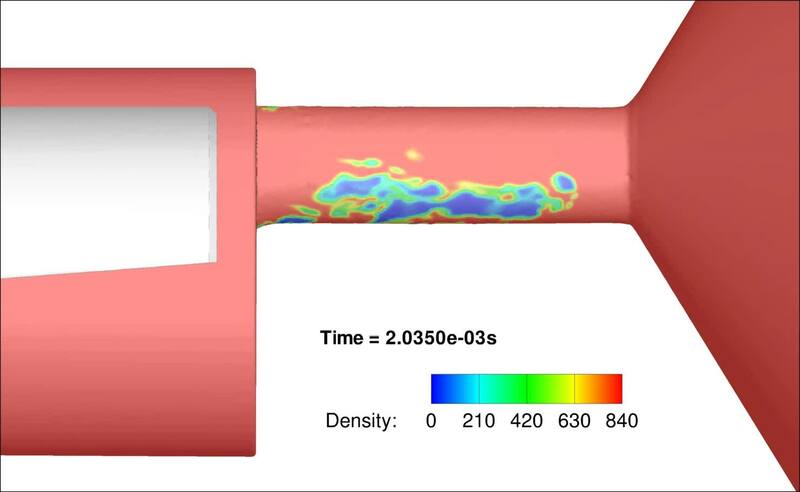 Andriotis, A., Gavaises, M. & Arcoumanis, C. 2008 Vortex flow and cavitation in diesel injector nozzles. J. Fluid Mech. 610, 195–215. Arndt, R. E. A., Arakeri, V. H. & Higuchi, H. 1991 Some observations of tip-vortex cavitation. J. Fluid Mech. 229, 269–289. Bakir, F., Rey, R., Gerber, A. G., Belamri, T. & Hutchinson, B. 2004 Numerical and Experimental Investigations of the Cavitating Behavior of an Inducer. Intl J. Rotat. Mach. 10, 15–25. Batchelor, G. K. 2000 An Introduction to Fluid Dynamics. Cambridge University Press. Battistoni, M., Duke, D. J., Swantek, A. B., Tilocco, Z. F., Powell, C. F. & Som, S. 2015 Effects of noncondensable gas on cavitating nozzles. Atomiz. Sprays 25 (6), 453–483. Bauer, D., Chaves, H. & Acroumanis, C. 2012 Measurements of void fraction distribution in cavitating pipe flow using x-ray CT. Meas. Sci. Technol. 23 (5), 055302. Bevington, P. R. & Robinson, K. D. 2003 Data Reduction and Error Analysis for the Physical Sciences, 3rd edn. p. 336. McGraw-Hill Education. Brennen, C. 1995 Cavitation and Bubble Dynamics. Oxford University Press. Budynas, R. & Nisbett, K. 2011 Mechanical Engineering Design. McGraw-Hill Education. Carlton, J. 2012 Marine Propellers and Propulsion. Elsevier. Chen, Z. J. & Przekwas, A. J. 2010 A coupled pressure-based computational method for incompressible/compressible flows. J. Comput. Phys. 229, 9150–9165. Cignoni, P., Callieri, M., Corsini, M., Dellepiane, M., Ganovelli, F. & Ranzuglia, G. 2008 MeshLab: an Open-Source Mesh Processing Tool, Sixth Eurographics Italian Chapter Conference, pp. 129–136. Coleman, H. W. & Steele, W. G. 2009 Experimentation, Validation and Uncertainty Analysis for Engineers. Wiley. Coutier-Delgosha, O., Reboud, J. L. & Delannoy, Y. 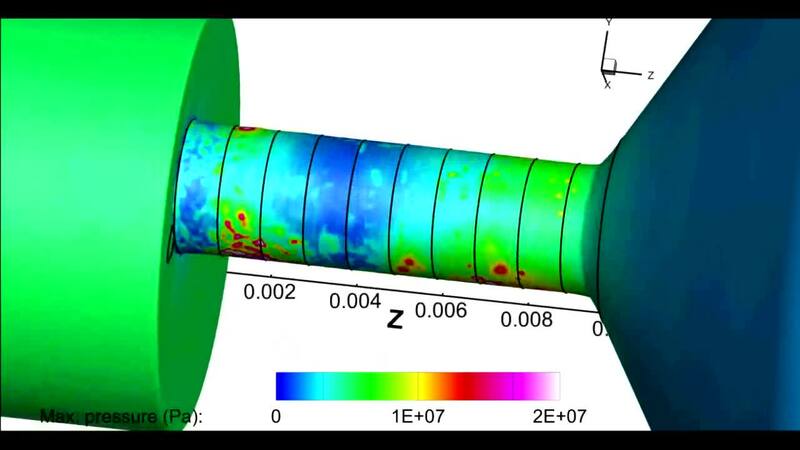 2003 Numerical simulation of the unsteady behaviour of cavitating flows. Intl J. Numer. Meth. Fluids 42, 527–548. Decaix, J., Balarac, G., Dreyer, M., Farhat, M. & Münch, C. 2015 RANS and LES computations of the tip-leakage vortex for different gap widths. J. Turbul. 16 (4), 309–341. Duke, D. J., Kastengren, A. L., Swantek, A. 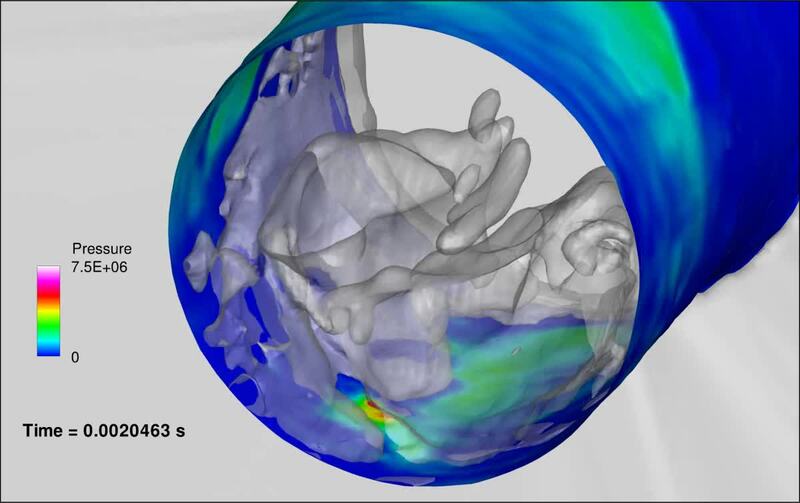 B., Sovis, N., Fezzaa, K., Neroorkar, K., Moulai, M., Powell, C. F. & Schmidt, D. P. 2014 Comparing simulations and x-ray measurements of a cavitating nozzle. In ILASS-Americas 26th Annual Conference on Liquid Atomization and Spray Systems, Portland, Oregon, USA. ILASS. Duplaa, S., Coutier-Delgosha, O., Dazin, A. & Bois, G. 2013 X-ray measurements in a cavitating centrifugal pump during fast start-ups. J. Fluids Engng 135 (4), 041204. Duttweiler, M. E. & Brennen, C. E. 2002 Surge instability on a cavitating propeller. J. Fluid Mech. 458, 133–152. Edelbauer, W., Strucl, J. & Morozov, A. 2016 Large Eddy Simulation of Cavitating Throttle Flow: SIMHYDRO 2014 (ed. Gourbesville, P., Cunge, J. A. & Caignaert, G.), Advances in Hydroinformatics, Part III, pp. 501–517. Springer. Egler, W., Giersch, J. R., Boecking, F., Hammer, J., Hlousek, J., Mattes, P., Projahn, U., Urner, W. & Janetzky, B. 2010 Fuel Injection Systems (ed. Mollenhauer, K. & Tschöke, H.), Handbook of Diesel Engines, pp. 127–174. Springer. Feldkamp, L. A., Davis, L. C. & Kress, J. W. 1984 Practical cone-beam algorithm. J. Opt. Soc. Am. A 1 (6), 612–619. Ferziger, J. H. & Peric, M. 2002 Computational Methods for Fluid Dynamics. Springer. Franc, J.-P. & Michel, J.-M. 2005 Fundamentals of Cavitation. Kluwer Academic Publishers. Ganesh, H., Mäkiharju, S. A. & Ceccio, S. 2016 Bubbly shock propagation as a mechanism for sheet-to-cloud transition of partial cavities. J. Fluid Mech. 802, 37–78. Giannadakis, E., Gavaises, M. & Arcoumanis, C. 2008 Modelling of cavitation in diesel injector nozzles. J. Fluid Mech. 616, 153–193. Gnanaskandan, A. s. & Krishnan, M. 2016 Numerical investigation of near-wake characteristics of cavitating flow over a circular cylinder. J. Fluid Mech. 790, 453–491. Green, M. A., Rowley, C. W. & Haller, G. 2007 Detection of Lagrangian coherent structures in 3D turbulence. J. Fluid Mech. 572, 111–120. Hult, J., Simmank, P., Matlok, S., Mayer, S., Falgout, Z. & Linne, M. 2016 Interior flow and near-nozzle spray development in a marine-engine diesel fuel injector. Exp. Fluids 57 (4), 1–19. IAEA2008 Neutron imaging: a non-destructive tool for materials testing. Nuclear analytical techniques. Austria, Vienna, International Atomic Energy Agency. IAEA-TECDOC-1604. Kini, V., Bachmann, C., Fontaine, A., Deutsch, S. & Tarbell, J. M. 2000 Flow visualization in mechanical heart valves: occluder rebound and cavitation potential. Ann. Biomed. Engng 28, 431–441. Kolev, N. 2007 Multiphase Flow Dynamics 3. Springer. Koukouvinis, P. & Gavaises, M. 2015 Simulation of throttle flow with two phase and single phase homogenous equilibrium model. J. Phys. : Conf. Ser. 656 (1), 012086. Koukouvinis, P., Gavaises, M., Li, J. & Wang, L. 2016 Large eddy simulation of diesel injector including cavitation effects and correlation to erosion damage. Fuel 175, 26–39. Koukouvinis, P., Naseri, H. & Gavaises, M. 2016 Performance of turbulence and cavitation models in prediction of incipient and developed cavitation. Intl J. Engine Res. 18 (4), 333–350. Li, S. 2000 Cavitation of Hydraulic Machinery. Imperial College Press. Lindau, O. & Lauterborn, W. 2003 Cinematographic observation of the collapse and rebound of a laser-produced cavitation bubble near a wall. J. Fluid Mech. 479, 327–348. Lockett, R. D. & Jeshani, M. 2013 An experimental investigation into the effect of hydrodynamic cavitation on diesel. Intl J. Engine Res. 14 (6), 606–621. Mauger, C., Méès, L., Michard, M., Azouzi, A. & Valette, S. 2012 Shadowgraph, schlieren and interferometry in a 2D cavitating channel flow. Exp. Fluids 53 (6), 1895–1913. Mihatsch, M. S., Schmidt, S. J. & Adams, N. A. 2015 Cavitation erosion prediction based on analysis of flow dynamics and impact load spectra. Phys. Fluids 27, 103302. 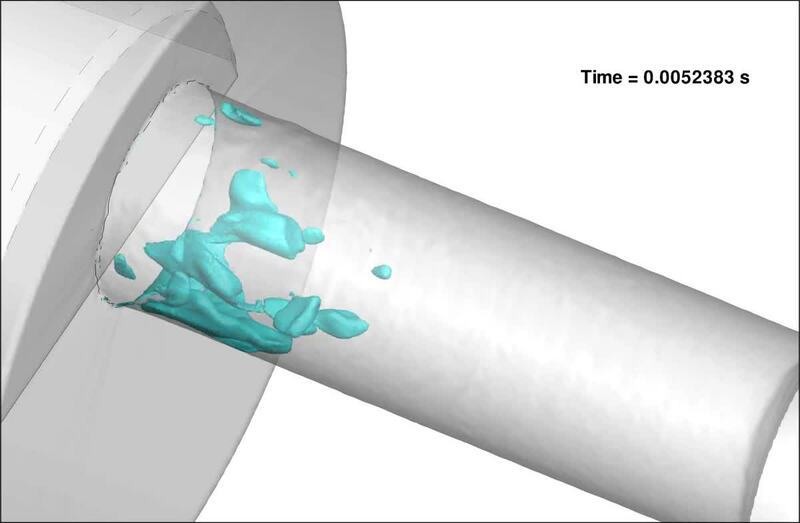 Mitroglou, N., Lorenzi, M., Santini, M., Gavaises, M. & Assanis, D. 2015 Application of cone-beam micro-CT on high-speed diesel flows and quantitative cavitation measurements. J. Phys. : Conf. Ser. 656 (1), 012094. Mitroglou, N., McLorn, M., Gavaises, M., Soteriou, C. & Winterbourne, M. 2014 Instantaneous and ensemble average cavitation structures in diesel micro-channel flow orifices. Fuel 116, 736–742. Mockett, C.2007 A comprehensive study of detached-eddy simulation. Universitätsbibliothek. Moon, S., Liu, Z., Gao, J., Dufresne, E., Fezzaa, K. & Wang, J. 2010 Ultrafast X-ray phase-contrast imaging of high-speed fuel sprays from a two-hole diesel nozzle. In ILASS Americas, 22nd Annual Conference on Liquid Atomization and Spray Systems, Cincinnati, Ohio, USA. ILASS. Örley, F., Hickel, S., Schmidt, S. J. & Adams, N. A. 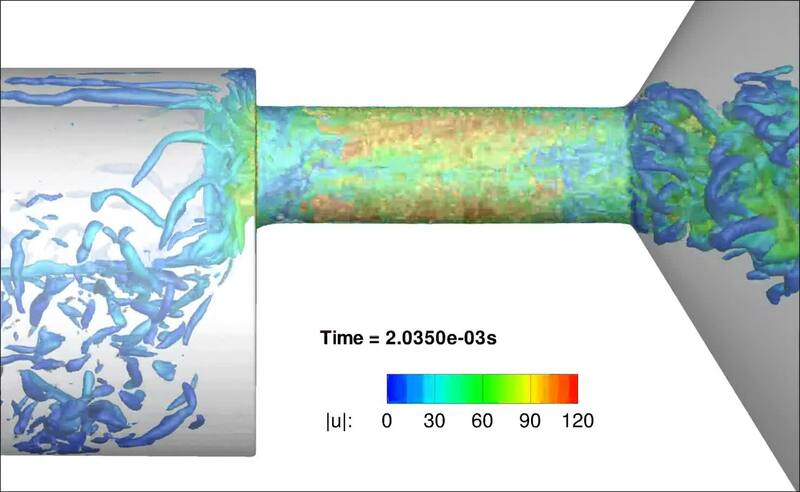 2016 Large-eddy simulation of turbulent, cavitating fuel flow inside a 9-hole diesel injector including needle movement. Intl J. Engine Res. 18 (3), 195–211. Pennings, P. C., Bosschers, J., Weserweel, J. & van Terwisga, T. J. C. 2015 Dynamics of isolated vortex cavitation. J. Fluid Mech. 778, 288–313. Reid, B. A., Hargrave, G. K., Garner, C. P. & Wigley, G. 2010 An investigation of string cavitation in a true-scale fuel injector flow geometry at high pressure. Phys. Fluids 22, 031703. Roache, P. J. 1997 Quantification of uncertainty in computational fluid dynamics. Annu. Rev. Fluid Mech. 29, 123–160. Schmidt, S. J., Mihatsch, M. S., Thalhamer, M. & Adams, N. A. 2014 Assessment of erosion sensitive areas via compressible simulation of unsteady cavitating flows. In Advanced Experimental and Numerical Techniques for Cavitation Erosion Prediction (ed. Kim, K.-H., Chahine, G., Franc, J.-P. & Karimi, A. ), pp. 329–344. Springer. Schnerr, G. H. & Sauer, J. 2001 Physical and numerical modeling of unsteady cavitation dynamics. In Fourth International Conference on Multiphase Flow, New Orleans, USA. ICMF. Shur, M. L., Spalart, P. R., Strelets, M. K. & Travin, A. K. 2008 A hybrid RANS-LES approach with delayed-DES and wall-modelled LES capabilities. Intl J. Heat Fluid Flow 29, 1638–1649. Sou, A., Hosokawa, S. & Tomiyama, A. 2007 Effects of cavitation in a nozzle on liquid jet atomization. Intl J. Heat Mass 50, 3575–3582. Stampouli, M. & Pappas, M.2014 CAE process workflow management of an automotive simulation scenario, SAE Tech. Paper 2014-01-0297:11. SAE International. Sun, T., Ganesh, H. & Ceccio, S. 2015 X-ray densitometry based void fraction flow field measurements of cavitating flow in the wake of a circular cylinder. In 68th Annual Meeting of the APS Division of Fluid Dynamics, Boston, Massachusetts, USA. American Physical Society. Thompson, J. F., Soni, B. K. & Weatherill, N. P. 1998 Handbook of Grid Generation. CRC. Tunstall, M. J. & Harvey, J. K. 1968 On the effect of a sharp bend in a fully developed turbulent pipe-flow. J. Fluid Mech. 34 (3), 595–608. Washio, S. 2014 Recent Developments in Cavitation Mechanisms: Cavitation Inception in Separating Water Flows. A Guide for Scientists and Engineers, pp. 133–157. Elsevier. White, F. M. 2011 Fluid Mechanics, Avenue of the Americas. McGraw-Hill. Zigan, L., Schmitz, I., Wensing, M. & Leipertz, A. 2012 Reynolds number effects on atomization and cyclic spray fluctuations under gasoline direct injection conditions. In Fuel Systems for IC Engines, pp. 253–263. Woodhead Publishing. Žnidarčič, A., Mettin, R. & Dular, M. 2015 Modeling cavitation in a rapidly changing pressure field – application to a small ultrasonic horn. Ultrason. Sonochem. 22, 482–492. Zwart, P. J., Gerber, A. G. & Belamri, T. 2004 A two-phase flow model for predicting cavitation dynamics. In 5th International Conference on Multiphase Flow, Yokohama, Japan. ICMF. Cavity shedding at low cavitation number (Cn= 1.5). Cavity shedding at high cavitation number (Cn = 2.18). Density distribution at the midplane of the geometry, at high cavitation number (Cn= 2.18). 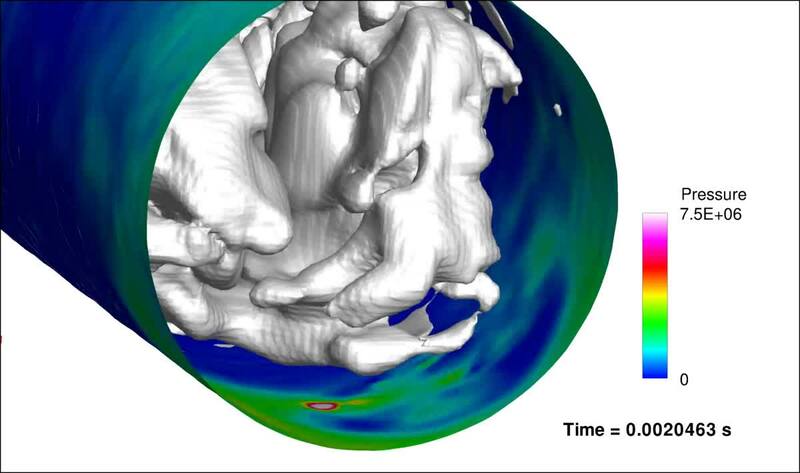 Animation of the 3D cavitation isosurface (95% liquid), showing the formation of cavitating vortices, starting from the needle. Instantanteous velocity magnitude at the midplane of the geometry (Cn = 2.18). Instantaneous pressure field on the throttle wall (Cn = 2.18). Note the rapid changes due to cavitation collapses. Pressure peaks on the wall of the orifice (Cn = 1.5). Pressure peaks on the wall of the orifice (Cn= 2.18). Collapse mechanism at the first erosion site (1 to 3.5 mm downstream the channel entrance). Cn = 2.18. Collapse mechanism at the second erosion site (5.5 to 8.5 mm downstream the channel entrance). Cn = 2.18.